I saw the tanaka package fly by on twitter, and in particular liked the application to the world population grid. Cities are interesting beasts, and I like exploring the extent of cities free from political boundaries. 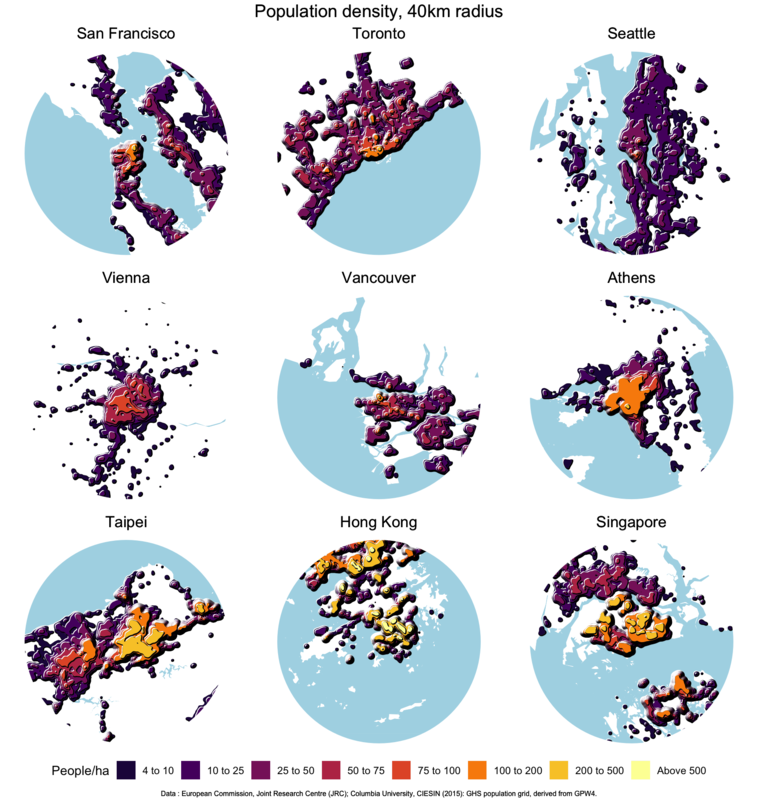 I am travelling right now, but I like looking at different ways to calculate and visualize density and could not resist running some inter-city density comparisons. For this, we only show areas with at least 4 people per hectare (or about 1000 people per square mile, the cutoff used by US Census to designate areas as urban), and pick some population density cutoffs above that to show grades of population density. We graph the cities on a 40km radius around the city centre to get an indication of the spatial extent of the functional metropolitan area. We are using the global 250m GHS 2015 population grid and smooth the data with a Guassian kernel with standard deviation 0.5km. The coverage of the dataset we are using is world wide, so let’s take a look at other cities around the world. We have to cut somewhere, sorry if a city you are interested in did not appear. But you can always grab the code and trow in other cities you like to see.